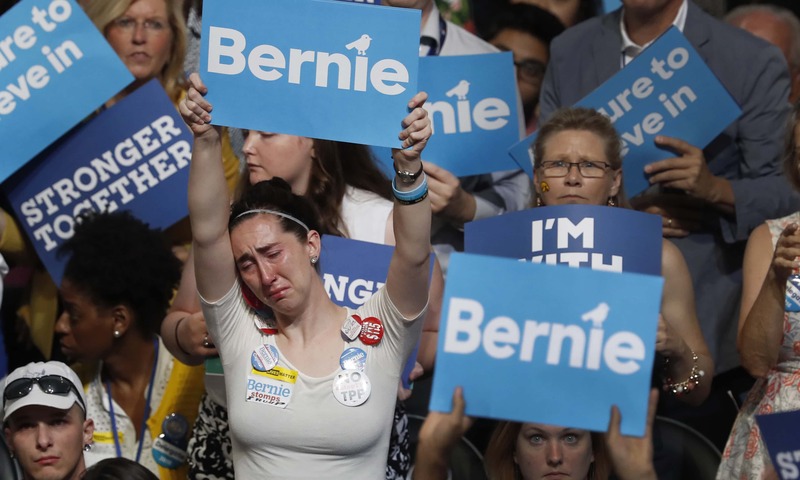 Taegan Goddard, author of Political Wire and one of the best, most even-handed aggregators around, just sent out this disturbing alert: Disappointed voters for Bernie Sanders who refused to hold their noses and vote for Hillary Clinton and voted instead for Donald Trump made the difference in the 2017 election. In Wisconsin, roughly 51K Sanders voters backed Trump in a state he won by just 22K votes. In Michigan, roughly 47K Sanders voters backed Trump in a state he won by just 10K votes. In Pennsylvania, roughly 116K Sanders voters backed Trump in a state he won by just 44Kvotes. The Cooperative Congressional Election Study has studied voting behavior since 2006 and is the work of 60 university-based research teams doing the most sophisticated survey analysis. The take-away from the facts and graphs, for me, is that, but for the pique of the 12 percent of Sanders voters who actually ended up voting for Donald Trump, we wouldn’t be going through our current national nightmare. Trump and Sanders both represented an anti-establishment protest. And Hillary Clinton’s much vaunted “experience” did speak to her being the ultimate establishment figure. Both groups opposed the Trans Pacific Partnership, which Clinton, not entirely believably, came around to doing as well. But the similarities end there. In some ways, it’s reminiscent of the impact of dispirited Robert Kennedy mourners or Gene McCarthy supporters in 1968 who either stayed home or voted for their grandmothers instead of party nominee Hubert Humphrey. The resulting .7 percent margin of victory for Richard Nixon would lead to Watergate, financial scandals, abuse of power, and ultimately the resignation of the President. The bottom line is: our votes count. They are not token expressions or tools to send a message. They may dictate choosing between the lesser of evils, but the choice must be made. So, I ask the Sanders-turned-Trump voters out there: are you happy now? I was distressed when the study came out. Letting time go by, I’m still distressed. Hillary and her arrogant campaign ran hard against Bernie. They seem to have failed to investigate what it was that led people to support Bernie, and to take steps to reach out to those voters. The sense of her entitlement in both ’08 and ’16 was a problem. The three noted states looked tight in advance; why wasn’t their a better response to that fact. Never going to Wisconsin when the Finegold vs. Johnson race was important to control of the Senate – bad campaging. We need to face it, we had a candidate whose strength was to beat Bernie, who could have beat Trump. “What’s done is done.” I hope this country can survive the irrational clown shoes now occupying the Oval Office. If this is true, hope they are enjoying ‘living their vote’! I bet they’re loving it. They obviously didn’t want 8-16 more years of corrupt corporate NeoLiberalism where nothing but the status quo prevails. We’ll end lifetime Supreme Court appointments in due time. Way to lose to Trump, you Loon. I happen to be very partial to loons, of the feathered variety. Maybe it wasn’t a good idea for the D party to nominate the least popular candidate in history. She was 20 points underwater. How could anyone expect her to win? She was not trusted by the public, so why did she keep a State Dept email server in her home? Maybe that had something to do with losing? She had fewer votes than Obama in 2012 in MI, WI, and PA.
I’m curious how the study was able to find out which voters were Bernie supporters and who they voted for, since votes are private and not tracked anywhere. It’s useful to go onto the survey and see the vast number of questions they asked, how they structured it and analyzed the results. I have worked with pollsters for John Kerry and Ray Flynn. This study was written by grad students? It would not stand up to peer review. The matching sampling methodology is highly flawed, and surveys were done 6 months after the election instead of at election time. Beware of studies that claim to know who individual voters voted for. The larger issue though: If there is one thing that Trump and his supporters have in common with Hillary and her supporters, it is being completely incapable of taking blame for anything. Hillary lost the election because of bad decisions she made, her history, running negative ads instead of ads describing what she wants to do as president, and campaign staff who were tone deaf to what was happening in the country. Where, oh where, is the next generation of leadership? Hillary-bots will find any excuse to blame for her loss. Why’d she lose in ’08? Why will she lose if she runs again? It’s time she accepts responsibility for the fact that she’s despised as much as Trump. Perhaps, but remember that this study is talking about a small minority of Bernie voters (12 percent of them, in fact) that nevertheless made the difference numerically in the election of Trump. Obviously, there were many factors, including Hillary’s shortcomings as a candidate, that colored the overall outcome. Kind of like saying there were many factors, including the use of hydrogen, that caused the Hindenburg to blow up. Best aggregator or not , this analysis seems to assume that Bernie supporters were essentially Hillary like voters. There was a stong vote of those who felt left out and they weren’t all liberals. Bernie spoke to them as well as those more liberal. Hillary’s campaign seemed never to want to understand what was going on and never tapped into that vote. She NEVER even spent one minute in Wisconsin! Talk about insulting! Hillary spent more time trying to defeat Bernie than undrstanding his voters. Several reliable polls showed Bernie better able to defeat Trump at the end. Not all of Trump voters were KKK lovers but they were never going to vote for Hillary. If only the DNC would start to realize that and move more effectively we might make some progress. Meanwhile, the endless analysis goes on…..and on. You are exactly right about the parallel with ’68. Some of us who lived through that disastrous election could see this coming, and warned our younger friends, for years. I guess every generation has to learn this sad lesson for itself.